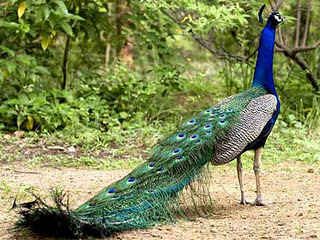 The Peacock, Pavo cristatus (Linnaeus), is the national bird of India. Emblematic of qualities such as beauty, grace, pride and mysticism, it is a multihued, swan-sized bird, with a fan-shaped crest of feathers, a white patch under the eye and a long, slender neck. Much in contrast to the natural phenomenon, the male specie of the bird is much more strikingly stunning than its female counterpart. The male bird, peacock, flaunts a gleaming blue breast and neck and a spectacular bronze-green train of around 200 elongated feathers. It is capable of extending its tail erect like fan as ostentatious display. Coming back to Hinduism, peacock is portrayed as the image of the God of thunder, rains and war, Indra. People believe that, when a peacock extends its tail erect like fan for an enchanting and mesmerizing demonstration, it indicates that rainfall is on the cards. Though this might sound strange, but the fact is somewhat true. On seeing the dark clouds, peacock outspreads its tail and starts dancing in rhythmic fashion. Its dance movement has been incorporated in most of the Indian folklore, including Bharatha Natyam. In southern part of India, peacock is considered as a 'vahana' or vehilce of lord Muruga. The male specie, peacock, is characterized with a 2.12 m (7.3 ft) length, in full breeding plumage, and weighs about 5 kg (11 lbs). The female bird - peahen, on the other hand, is about 86 cm (34 in) long and weighs about 3.4 kg (7.4 lbs). Adoring the glistening blue-green plumage, the Indian peacock has an extension of feathers on its back. Each feather is exemplified with an eye at its end. The Indian peahen is a mixture of dull green, grey and iridescent blue, with the greenish-grey color outweighing. The bird is mostly found in the dry semi-desert grasslands, scrub and deciduous forests and feeds on mainly seeds, but some also eat insects, fruits and reptiles.